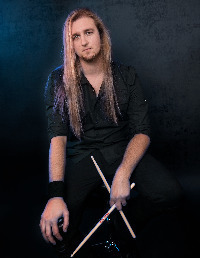 Dylan Suierveld (drummer, Levinia) is a self taught drummer. Born in Bellflower, California in February 1993; Dylan began drumming at the age of three. Getting his first drum-kit at the age of four. Growing up in a family that loved Rock N Roll, Mick Fleetwood from Fleetwood Mac was his very first influence for playing drums. Seeing him play with passion and his jolliness really stood out; as well as his big drum kit, which is why Dylan loves big drum kits. His liking of orange finishes came from Fleetwood as well. For example, Fleetwood's kit during The Dance era. Years later in 2011, Dylan and his cousin started his first band named Aerius. Performing many many shows and a few demos, till it was disbanded in early 2016. Soon after Dylan and ex-Aerius guitarist John Pinon started their current band, Levinia. After the full lineup, they’ve recorded a full 5 song demo named Alluring Fear and a 5 song Ep named Liberation. Receiving incredible reviews, airplay and gaining more fans, Levinia is pushing themselves to be heard in the Metal scene. Working extremely hard on all their goals. His main influences come from drummers like: George Kollias, Mario Duplantier, Vyl, Aquiles Priester and Fredrik Andersson. Dylan’s drumming interest’s go farther than just Metal/Rock, he really enjoys playing Pop, Funk, R&B and Country. Other influences come from Jeff Porcaro, Kenny Aronoff, Ringo Starr, Pick Withers, Eric Moore and Aaron Spears. Dylan is also endorsed by Agean Cymbals, HHG Drums, and Los Cabos Drumsticks.